The 1960s were exciting years in commercial aviation — this was the era when the major airlines were making the transition from propliner to pure jet. 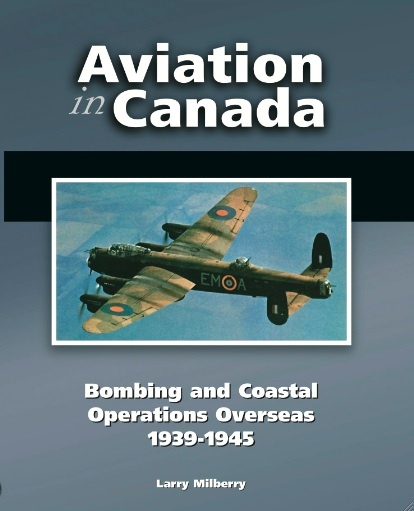 So it was in Canada that TCA and CPA introduced the DC-8 to replace the Super Constellation, DC-6B and Britannia. Suddenly we aviation fans were sitting anxiously at the end of the runway at Malton watching for a distant blotch of black smoke signaling the arrival of a Boeing 707, 720 or 727, or a DC-8. We got so mesmerized by the big new jets, that we began passing up the propliners that were interspersed on approach. Oh well, we were dumb kids, right, and had a pretty limited sense of history. One of the great thrills, of course, was the sight of a “727”. Soon we were seeing them all over as we wandered around Canada and the US. They were sleek and shiny and in a great variety of lovely paint jobs. The Boeing 727 had flown initially at Renton, Washington on February 9, 1963. 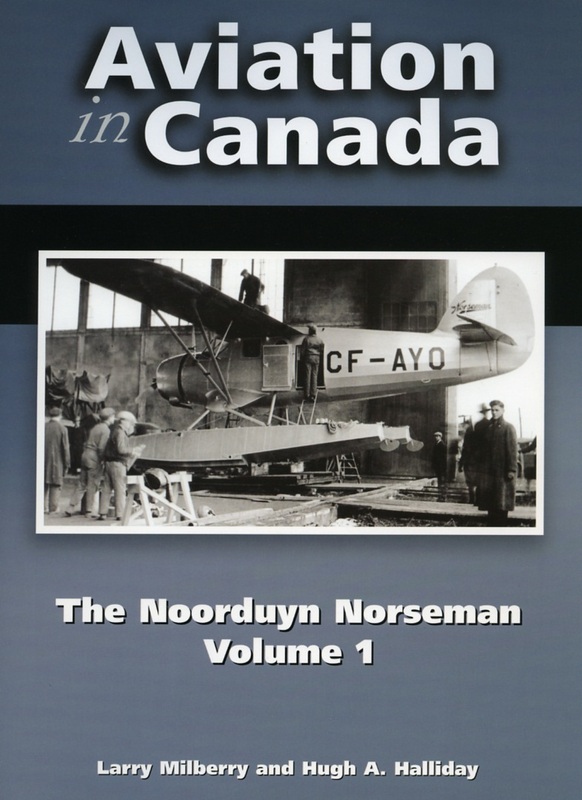 Coincidentally this also was the 54th anniversary of the flight of the Silver Dart at Baddeck, Nova Scotia, i.e., the first manned, powered, heavier-than- air flight in Canada. Boeing envisioned a market for 250 727s but, in the end, 1832 rolled off the line, the final example in March 1987. I flew on the 727 earlier, but the first flight that I bothered noting was that of July 8, 1987 – an Air Canada trip from Toronto to Regina. 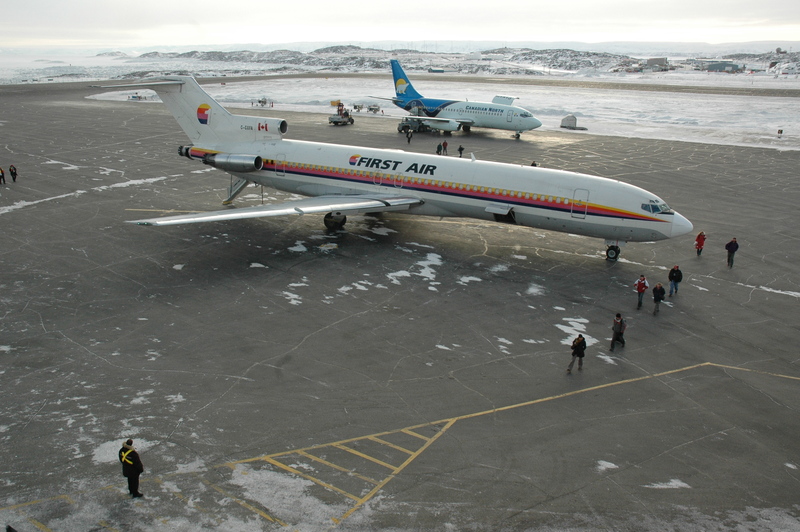 My last 727 flight was on First Air’s C-GXFA travelling from Ottawa to Iqaluit on February 16, 2007. American Airlines 727-23 “Astrojet” N1908 approaches Chicago O’Hare on August 28, 1966. I was there that day with pal Nick Wolochatiuk on one of our periodic Great Lakes trips in Nick’s VW. Delivered the previous May, N1908 served AA into 1992, when went into storage at Maxton, North Carolina. The following year it was sold to cargo specialist Emery Worldwide Airlines for parts and scrapping. Having joined AA in February 1965, 727-23 N1988 served to 1993. Here it is at Buffalo, NY on a blustery March 20, 1965. Buffalo was one of the best spots for aircraft photography. Almost never were we rousted from the tarmac, beside a taxiway, from a hangar, etc. A friendly place for sure! N1988 later served on various leases. It was sold in 1998 to Million Air Charter of Johannesburg, where it was seen derelict in recent years. Some 727s accumulated more than 50,000 flying hours. 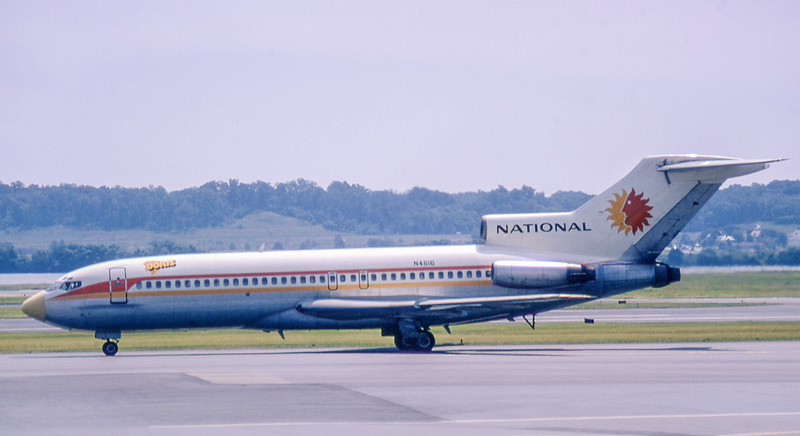 Boeing 727-35 N4620 of National Airlines smokes in for a landing at Miami on December 28, 1966. 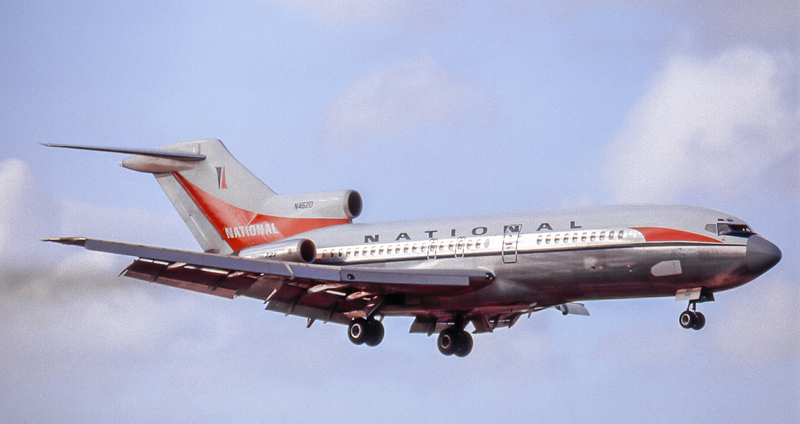 When National folded in 1980, N4620 (named “Lynn”) moved to Pan American as “Clipper Sportsman”. In 1984 it went to a US company called Gulf Air Transport, then migrated to AVENSA of Venezuela. Last heard of there in Y2K. 727-35 N4616 “Doris” in a subsequent paint scheme adopted by National. It later served Pan Am, then others until purchased by Boeing in 1985 to be converted into a USAF C-2. As such it served into the early 2000s, then was sold to a new owner in El Paso. “Doris” is seen at Washington National on May 2, 1972. N8110N of Eastern Airlines taxis from the terminal at Dorval on February 19, 1966. By now all the buildings in the background have been demolished. 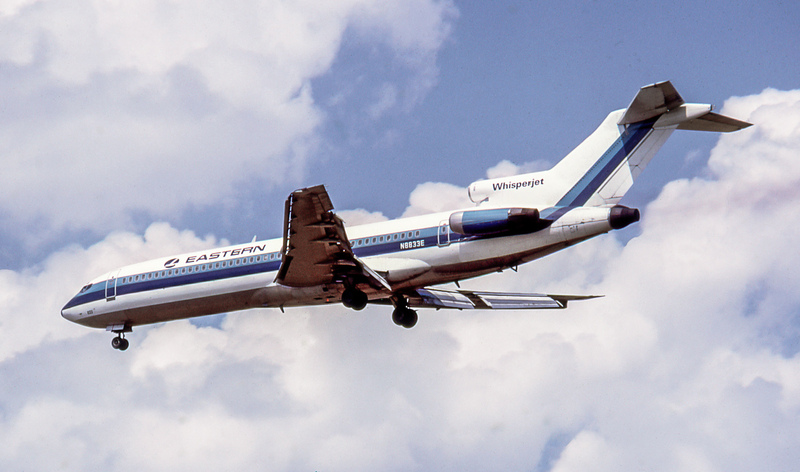 EAL was the first 727 operator, N8110N being its 10th example. It served into 1981, then went for scrap. N8833E lands at Toronto on August 1, 1970. 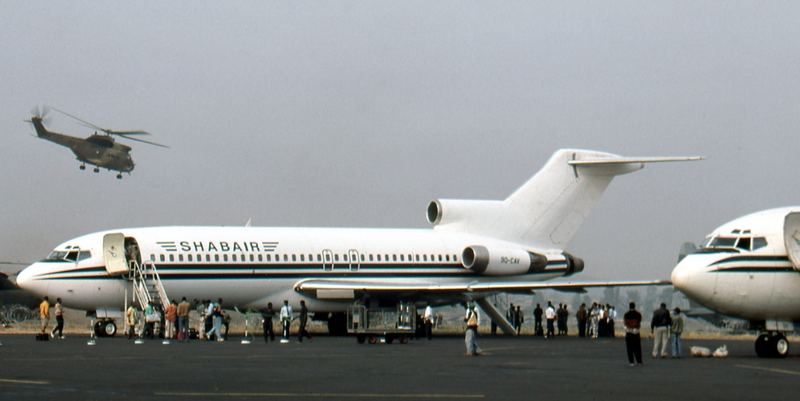 Delivered in December 1969, this 727-225 served EAL into the mid-eighties. Thereafter, it had periods on lease or in storage. 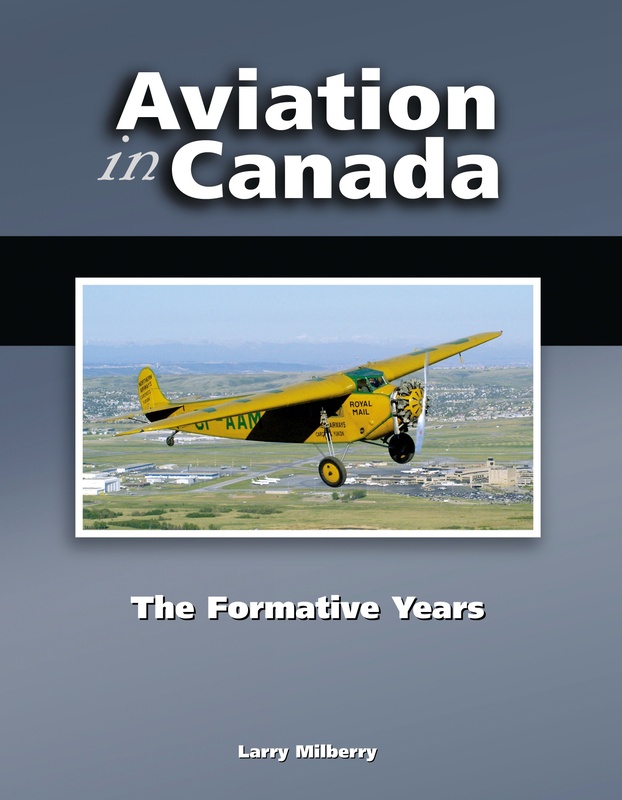 In 1996 it was leased to Kelowna Flightcraft. 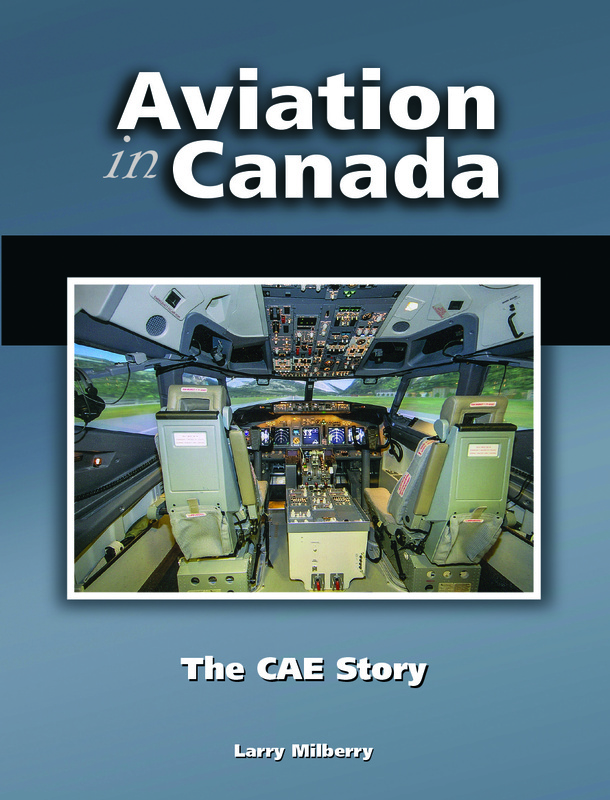 Registered C-GACU, it operated to about 2010 doing Purolator cargo runs from Hamilton, Ontario. 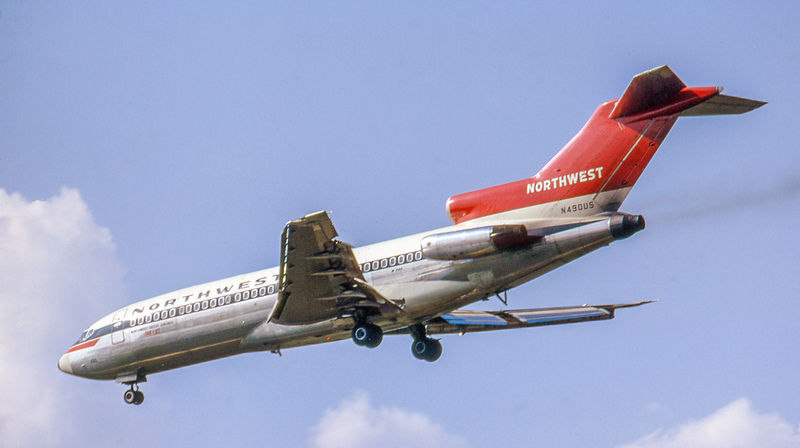 Another renowned 727 operator was Northwest Orient Airlines of Minneapolis. 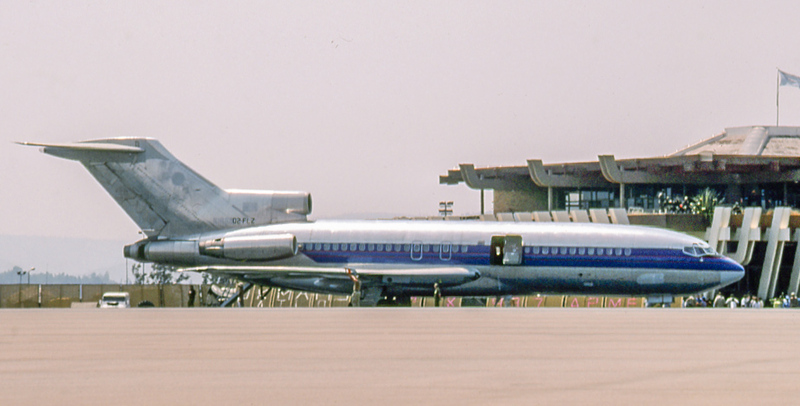 Here its recently-delivered 727-51C N490US lands at O’Hare on August 28, 1966. It served NWA into 1984, then flew cargo for Emery Worldwide Airlines 1984-92. N490US ended its days with UPS, from where it retired to storage in New Mexico in 2003. 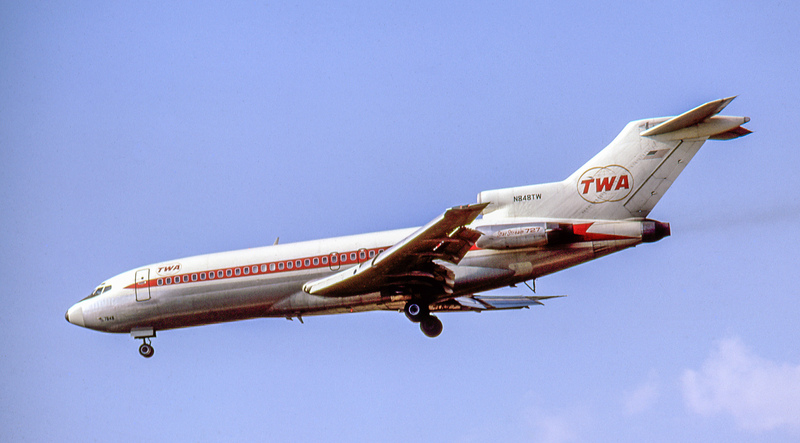 TWA was another key 727 operator. Here its “Star Stream 727” N848TW, delivered in September 1964, lands at O’Hare on August 28, 1966. Later named “City of Vienna”, N848TW ended on the scrap heap in Y2K. 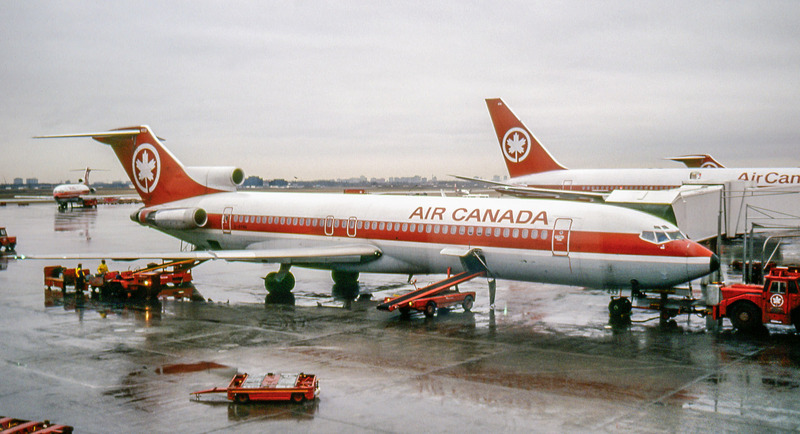 From 1974 the 727 was the backbone on Air Canada’s medium-haul routes. 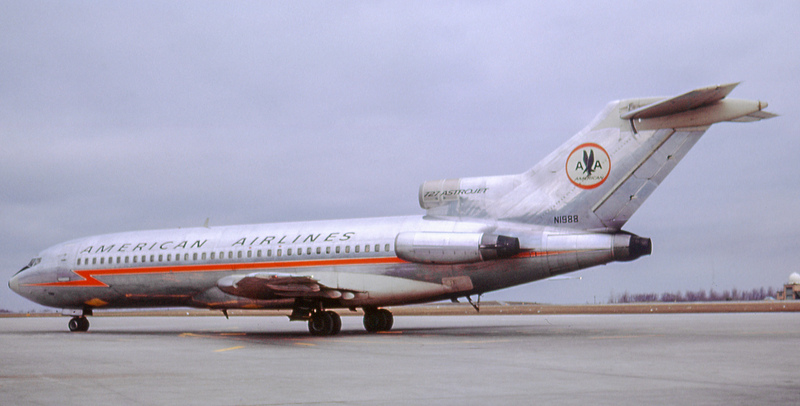 Shown is C-GYNG, which served 1981-87 including a stint with affiliate Air Jamaica. 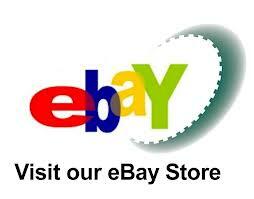 “YNG” was sold to FedEx in 1991. There it operated as N280FE into 2011, when it was banished to the airplane bone yard at Victorville, the former George AFB near San Bernardino. 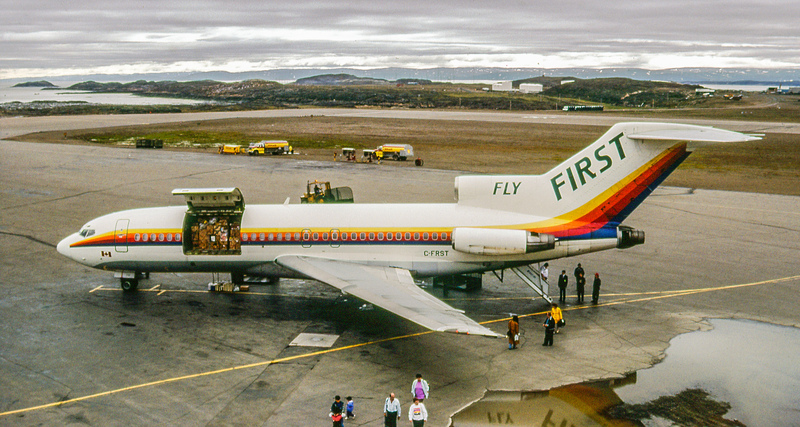 Last to operate the 727 on scheduled routes in Canada was Ottawa-based First Air. 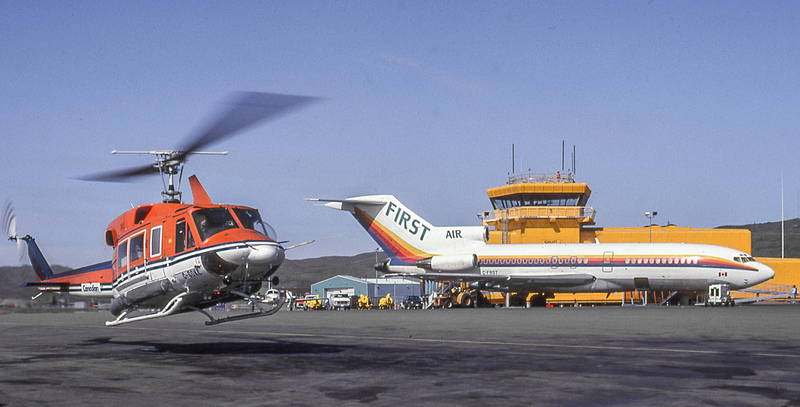 Here are two views of First Air’s “combi” C-FRST at YFB Iqaluit on August 12 and 15, 1992. A 727-90C, “RST” originally had been delivered to Alaska Airlines in 1966, from where First Air acquired it in 1985. “RST” left service in Y2K. 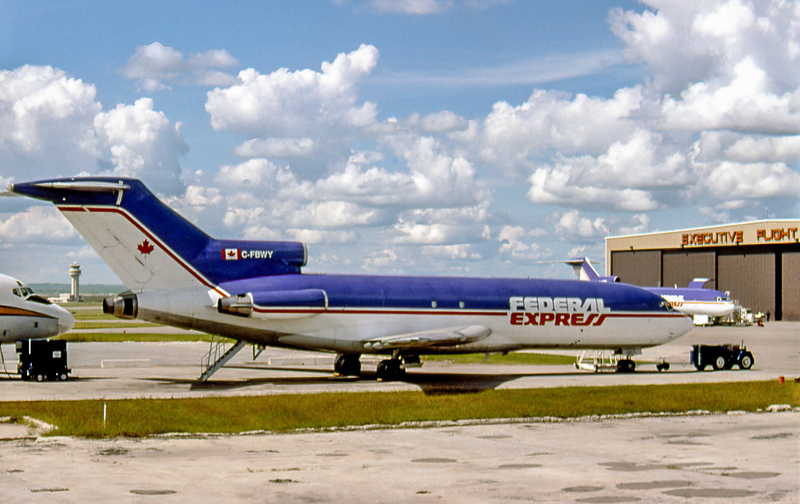 Several all-cargo 727s still operate in Canada with Cargo Jet Airways and Kelowna Flightcraft. 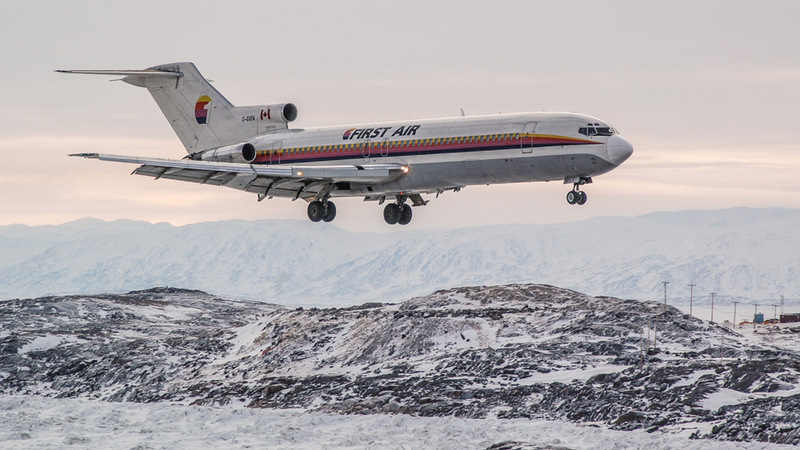 First, Air 727 C-GXFA approaches to land at YFB Iqaluit on a clear day in February 2006. Then (below) it’s seen from the control tower as the passengers deplane. From 1975-90 “XFA” had been Air Canada C-GAAG, then was with Air Transat ’til joining First Air in 1994. 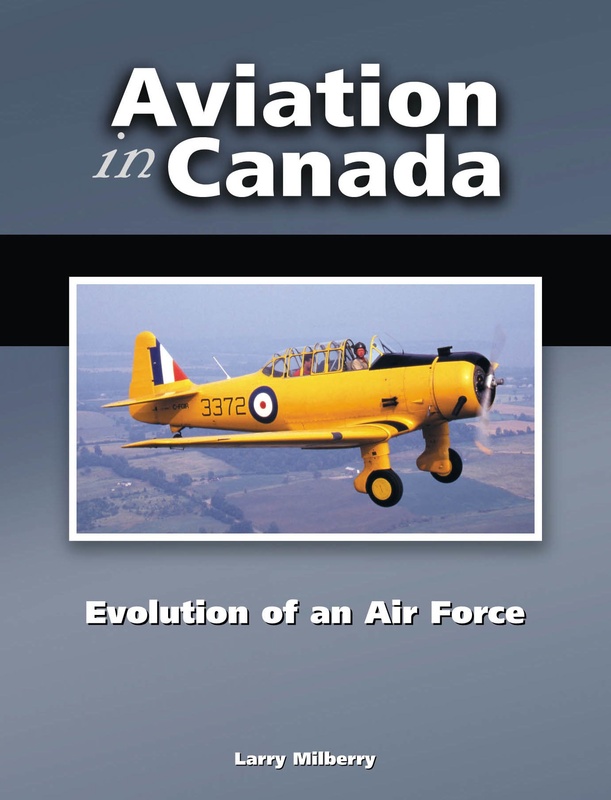 In about 2008 “XFA” went into long-term storage at Trois-Rivieres, but no longer is there. Scrapped, perhaps, or flown away in some new resurrection?. Fifty years ago today the 727 — one of Boeing’s greatest — roared down the runway at Renton Municipal Airport. Pilot Lew Wallick pulled back on the control wheel and the great airplane lifted into the skies. That airplane landed at Paine Field in Everett — its first-ever landing. It went onto fly over 60,000 hours for United, then made its last landing (to date) again at Paine Field, where it has resided for the past 22 years. It was followed by another 1831 siblings, who made the 727 truly a great airplane. We hope to fly her one more time – to Boeing Field in Seattle – her REAL last landing. We had hoped to do it today on its Golden Anniversary. Not all things that are hoped for come true, but we have come a long ways to make it happen. Together with super dedicated Crew Chief T.C. Howard and help from some other folks like Boeing and FedEX, hopefully we can make it happen yet – this year 2013, the 727’s Golden Anniversary. Happy Birthday 727. You are something special. 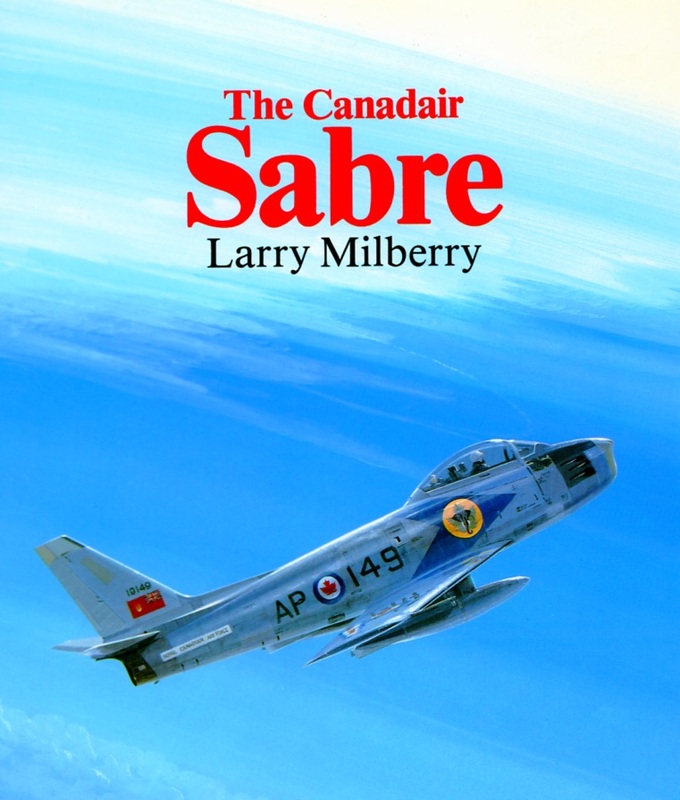 For another take on 50 years of the 727, check out Pierre Gillard’s excellent piece. 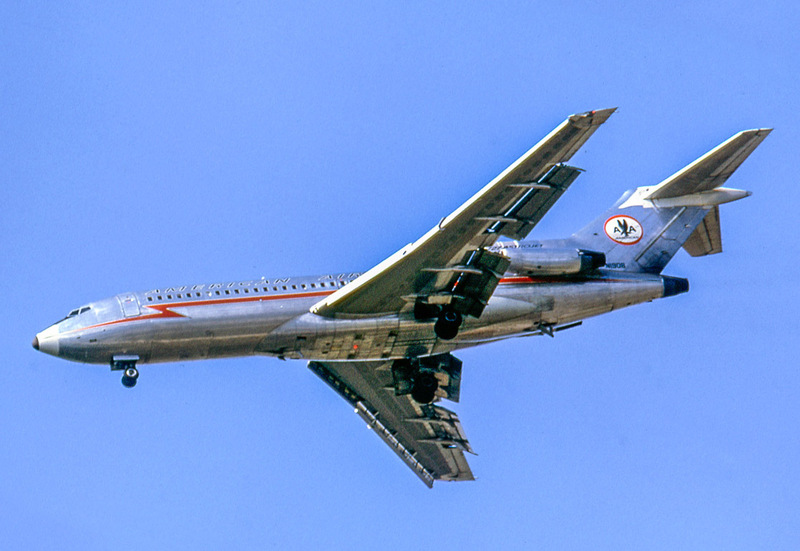 During its gaudy orange era, CPA operated four 131-seat 727-117s (1971-77) and two 189-seat -217s (1975-80). 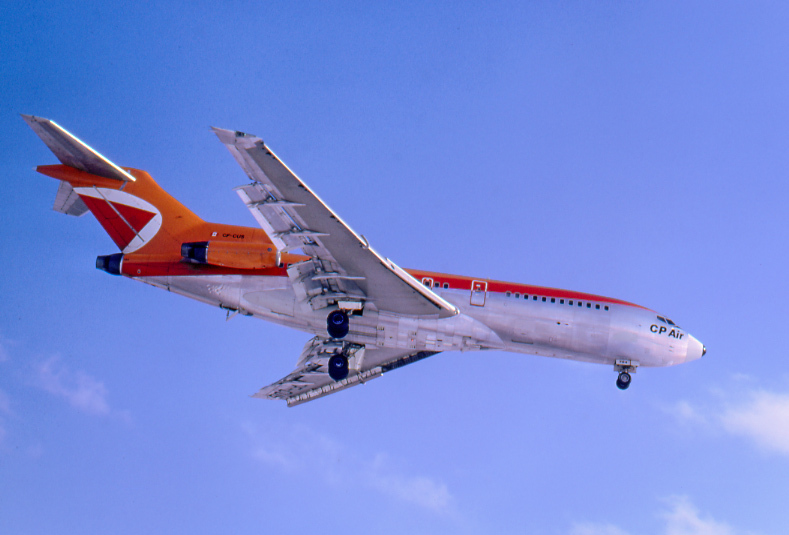 CF-CUS later served in Mexico and Ecuador before being scrapped in Miami in 1998. It’s seen on approach at Toronto on March 6, 1972. CP Air 727 CF-CPK in the background at Toronto on March 16, 1973. At the time I was panning the taxiing McCullough’s Electra — ex-American Airlines N6118A. 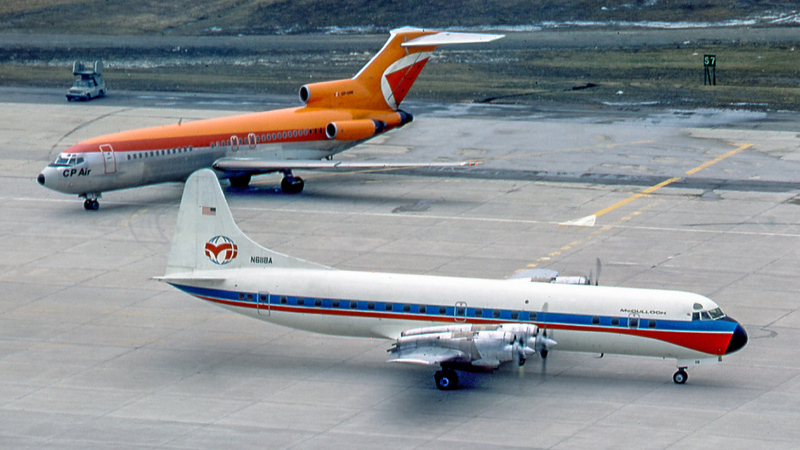 Having served CP Air 1970-77, CF-CPK migrated to Mexico, Ecuador and the UK. It made its final landing in Ecuador, where it was photographed in derelict condition as lately as 2006. 727-22 (F) C-GBWY began with United Air Lines in 1966, where it served 25 years. It joined FedEx in 1990 and the following year came to Canada for FedEx contractor Brooker Wheaton, then Max Ward’s Morningstar Air Express. In 2004 it returned to the US as N192FE, retired from FedEx in 2007 and presently is a ground training aid at Denver. The FedEx website in February 2013 noted that 79 727s remained in the fleet, but these fast were being replaced by more fuel-efficient 757s. C-GBWY is seen at Calgary on July 4, 1993. Air East Africa 727-44 N723JE started in 1965 as ZS-DYR with South African Airways. It served there until sold in Colombia in 1982. 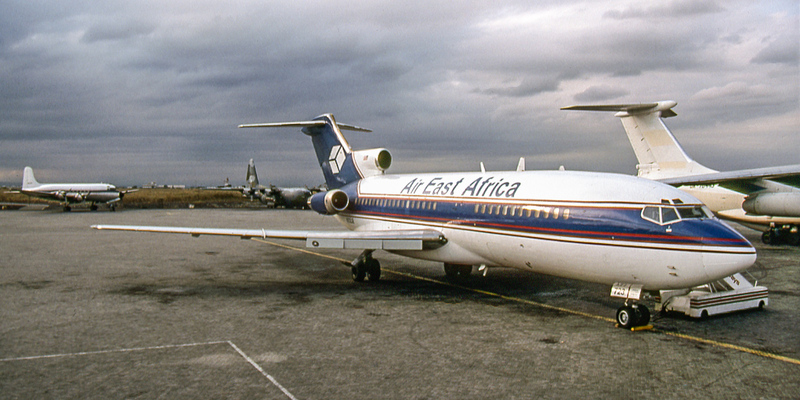 In 1985 it became N723JE, then found its way back to Africa, still as N723JE. When I photographed it at Nairobi, Kenya on August 4, 1994, it was associated with the Texan company, Custom Air Transport, whose DC-4 is in the background (ownership of such tramp planes often is tricky to follow). While based here, both aircraft were operating in the Great Lakes region in the time of the horrendous turmoil in Rwanda/Congo/Burundi. Tramp freighters always swarm to such regions in search of quick money carrying anything or anybody for a price. N723JE finally went for scrap at Miami in 2001. 9Q-CAV at Goma, DRC in August 8, 1994, where pandemonium reigned and everyone seemed to be carrying a weapon. Having begun in 1966 as N8143N with Eastern Airlines, this 727-25 later flew for Trump Shuttle, before going to the DRC in 1991. 9Q-CAV is thought to have been put out to pasture in 2007. This entry was posted in Air Canada, Boeing and tagged 727. Bookmark the permalink. Don’t forget Wardair’s B727-100 “Cy Becker” CF-FUN which was the first Boeing Jetliner sold in Canada in 1966. 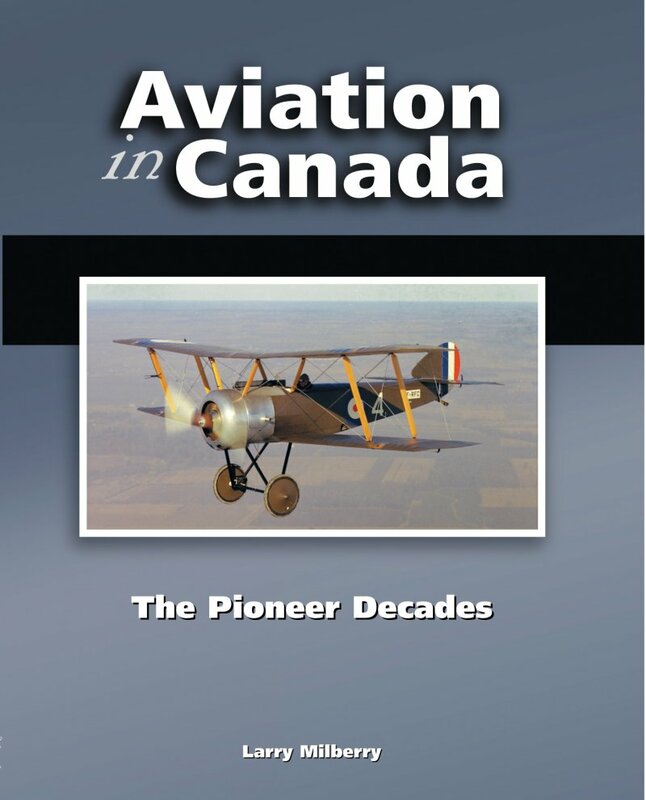 Thousands of Canadian experienced inexpensive travel or the first time on Canada’s most famous Charter Airline. Great 727 souvenirs ! Thanks for sharing, Larry. 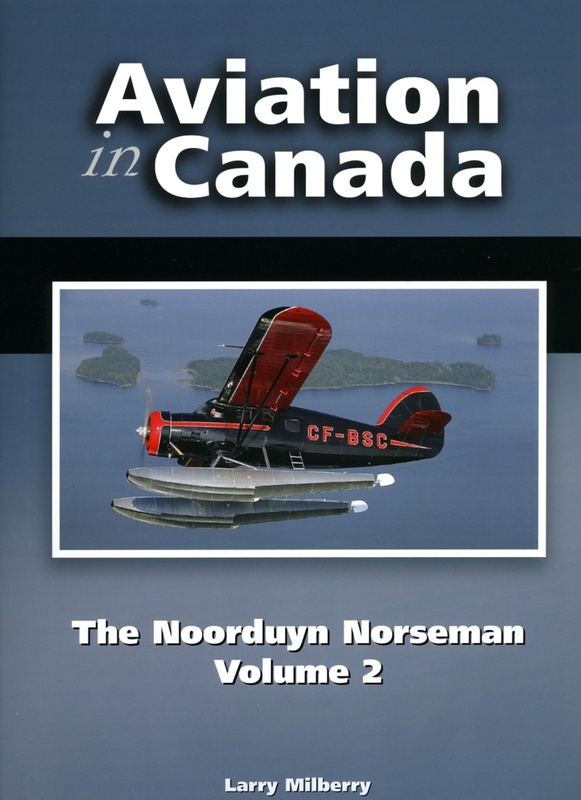 Original aviation photos & more!